A few months back I ran across a math blog carnival with LetsPlayMath.net This is a monthly carnival during the second week of each month. While my site focuses on elementary level math concepts, I strongly think that young kids can understand complex concepts that are not taught until much later (and I think most math teachers feel that way. Do you agree?). The Math Teachers at Play Blog Carnival can contain math concepts/topics from Pre-school to Calculus. 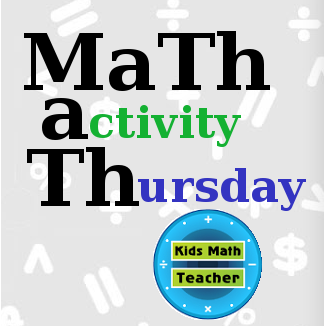 I volunteered to host this month and will call this my MaTh (math activity Thursday) as well. You can link up any math post you want to share at the bottom. This month for December's carnival there were 12 days of Christmas entries! I put them in order starting from earliest math to the most advanced math. 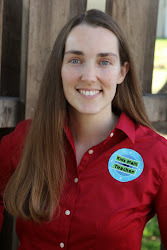 Sheryl doesn't have a blog, but she shares things on a facebook page and is pro Montessori. Here she shares an article entitled "What is Developementally appropriate in Learning" which discusses children and numeracy education. This covered all educational age groups. On Crystal's blog, Triumphant Learning, she shares her thoughts and ideas about speaking with Math Language (or using math terms in everyday situations). She gives a suggested resource and a good amount of beginning math terms. This approach is applicable for babies up to high schoolers (although her list is for the elementary level). Claire has some fun ideas to organize and teach measurement and other simple math concepts with Mr. Man and Ms. Naughty applicable for Pre-K through 1st. Great organization and fun math activities! On Maria's Moebius Noodles blog she made a fun post called Do your kids draw grids? (love the rhyme!) She shows us that young children through adults can draw with grids and it is natural to do so. Margo has a fun subtraction with Santa's bag activity on her blog. It looks like a lot of fun and could be used for Pre-K through 2nd grade curriculum easily, or just as a fun activity. Kinder through 3rd graders will enjoy these ideas posted in this article by Early Math Collaborative about the book Too Many Tamales. We all need math reasoning, right? Fran shares her love of origami with Christmas themed origami! There are 30 links to instructions and video suggestion on how to make them. Kids ages (approximently) 6 up through adults will enjoy this! Muhammad has a post about doughnuts (a real world example) and rounding off non-divisible numbers (with the price). I feel this is applicable for 4th-7th graders. A nice reflection post. Here is a post from Colleen most suitable for the 4th to 9th grade range. It's all about Christmas themed math! There are so many useful links (over 50!). What a great post! Loved everything (especially the Christmas fonts). Denise at Let's Play Math has a great post about pondering large numbers. Can you plot numbers in the correct spot when it comes to a trillion? Fun for kids young and old, but feel that 4th graders and up would find it the most fascinating. Kevin shares with us a math trick he uses of dividing multiple of 10 (up to 100) by 91--students who can do it get to be in Club 91 if they beat the calculator. There is a brief video showing how to do it. This can be applicable for students from 8th grade and up. Here is a Calculus post from Sam about limits entitled I got rid* of Limits in Calculus (*almost entirely). I like that he tries to teach more conceptually (perhaps he'll write a book someday ; ) according to the comments). Any other bloggers out there who have a math post, you can participate in the monthly carnival or host it. 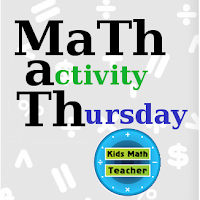 If you want you can also add your link below for math activity Thursday (the linky I host every Thursday). Until next week... Stay warm everyone!